Jim Self is a Los Angeles-based freelance musician. Since 1974 he has worked for all the major Hollywood studios performing for over 1500 motion pictures and hundreds of television shows and records. His solos in major films include John William’s scores to Jurassic Park, Home Alone and Home Alone 2: Lost in New York, Hook, and was the “Voice of the Mothership” from Close Encounters of the Third Kind. Other solos can be heard in James Horner’s Casper and Batteries Not Included, Marc Shaiman’s Sleepless in Seattle and in Jerry Goldsmith’s score to Dennis the Menace. Recent films include Wall-E, Troy, Lemony Snicket’s A Series of Unfortunate Events, The Legend of Zorro, War of the Worlds, King Kong, Indiana Jones and the Kingdom of the Crystal Skull, The Princess and the Frog, Valentines Day and Avatar. Upcoming films include The Adventures of Tintin: The Secret of the Unicorn, Toy Story 3, Cats and Dogs: The Revenge of Kitty Galore and The Last Airbender. Josh Grobin, Cassandra Wilson, Claus Ogerman, Mel Torme, Leon Redbone, Maynard Ferguson, Randy Newman, Bette Midler, Barbara Streisand, Frank Sinatra, Don Ellis, the L.A. Philharmonic, LA Opera, Pasadena and Pacific symphonies, and the Hollywood Bowl Orchestra are among the many artists and groups with whom he has recorded. Self was the string bass and tuba player with Jon Hendricks in his long running L.A. production of “Evolution of the Blues.” He holds principal tuba positions with the Pacific Symphony, Pasadena Symphony and the Hollywood Bowl Orchestra and principal tuba/cimbasso in the Los Angeles Opera Orchestra where they are in the middle of a two-year run of the Wagner Ring Cycle. In l983, Self produced his first album, Children at Play. It features jazz tuba and harmonica and has received world-wide acclaim. It was chosen by High Fidelity magazine as one of the top ten jazz albums of that year. A second recording, New Stuff (fusion jazz), was released in l988 on compact disc. Both are on the Discovery-Trend label. His third recording, Tricky Lix, was released in 1990 on the Concord Jazz label featuring jazz greats Gary Foster and Warren Luening. In 1992, an all “classical” CD Changing Colors came out on the Summit label. A jazz CD, The Basset Hound Blues, with Pete Christlieb was released on d’Note Records in 1997. In 1999, a second “classical” recording, The Big Stretch, came out on Basset Hound Records. It features original compositions by Self and others. That was followed by a CD of folk songs entitled My America with arrangements of American songs by Kim Scharnberg. Self is assisted by a great band of L.A. studio musicians and plays his new horn the FLUBA. Next Self recorded a quintet CD of jazz standards and originals called Size Matters, with great Tennessee tenor man, Bill Scarlett. Then came InnerPlay, a jazz and strings CD featuring Gary Foster, Pete Christlieb and Dan Higgins. InnerPlay was chosen by Jazz Times magazine as one of the top 50 jazz albums of 2006 and that same year Self was nominated for the prestigious Downbeat Critics Poll. Returning to his roots, Self and harmonica virtuoso, Ron Kalina released a new be-bop CD called The Odd Couple. In 2013 Jim released Tis the Season TUBA Jolly with the Hollywood Tuba 12. In 2016, ¡YO! with the Tricky Lix Latin Jazz Band and in 2017 Floating in Winter, a duo jazz CD with guitar great John Chiodini. All of Self’s recordings and compositions are available from: www.bassethoundmusic.com. Self is a past president of I.T.E.A., is a former faculty member of the University of Tennessee, and is a former member of The United States Army Band, Washington, D.C. Born in 1943 in Franklin, Pennsylvania, (raised in nearby Oil City), he holds degrees from Indiana University of Pennsylvania, Catholic University and a doctor of musical arts from the University of Southern California Thornton School of Music, where he is adjunct professor of tuba and chamber music. In the summers he teaches students at the Music Academy of the West, and (formerly) at the Henry Mancini Institute and the Hamamatsu Wind Festival and Academy in Japan. His primary tuba teachers were William Becker, Harvey Phillips, and Tommy Johnson. Self has also been the leader of Tuba Christmas in Los Angeles since it’s beginning in 1976. In 1978 he organized and hosted the 3rd International Tuba Euphonium Conference at the University of Southern California, and he founded The Los Angeles Tuba Quartet with Tommy Johnson, Roger Bobo and Don Waldrop, and later, Los Tubas, a group of “loose” L.A. tuba players. For several years he has sponsored Creative Tuba Scholarships at various American universities. In December 2008, Self was invited by Gene Pokorny to play a week of Symphonie Fantastique with the Chicago Symphony. Self was three times voted the Most Valuable Player Award for Tuba by the National Academy of Recording Arts and Sciences (NARAS) and named Emeritus winner in l987. In March 2003, Self was given a Distinguished Alumni Award by Indiana University of Pennsylvania—a university wide honor only given to 290 of the more than 120,000 graduates. 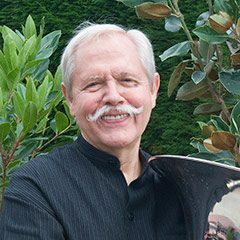 In June 2008, Self was given the Lifetime Achievement Award by the International Tuba-Euphonium Association at the Cincinnati Conservatory. At that same conference, he was also awarded the 1st Roger Bobo Award for Excellence in Recording (Jazz) for his CD InnerPlay. Besides his work as a tubist, Self maintains an active doubling career performing on bass trombone, cimbasso, contra-bass trombone, and (rarely now) string and electric basses and the Steiner EVI (electronic valve instrument). His latest new instrument is the FLUBA—an original design (picture a tuba-sized flugel horn). It is very unique and is a great solo instrument. Self is the author of the chapter “Doubling for Tubists” in The Tuba Source Book. His hobby is flying his 1973 Piper Arrow for fun, and sometimes to gigs. Self is also a published composer and arranger. He has about 60 titles for brass, string and woodwind chamber music, works for band, orchestra, solo tuba and trombone. The Pacific Symphony recently commissioned him to write a feature work for the orchestra called Tour de Force: Episodes for Orchestra. The 13 minute piece was premiered at the Renee and Henry Segerstrom Hall in Orange County on April 17-20, 2008, to great acclaim. He has since scored Tour de Force for wind ensemble. The east co-premier was at Indiana University of Pennsylvania in September with Jack Stamp, and the west premier will be at USC in March 2010, H. Robert Reynolds, conducting. His latest work is Woojoo for eight F tubas and drums. It was written for and recorded by the entire USC tuba class in 2009. Portuguese tuba virtuoso, Sergio Carolino, is a champion of Self’s music and has commissioned, performed, and recorded several of his works. As a solo artist, Self performs regularly worldwide. His concerts and clinics present an interesting blend of classical and jazz music, and represent a wide spectrum of his many experiences as a performer, composer, and teacher. He is a Yamaha Performing Artist.